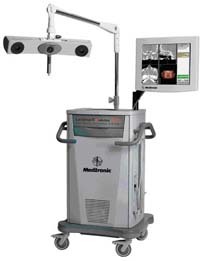 Using a technology similar to a global positioning system (GPS), navigation provides the surgeon the ability to see a patient’s anatomy in three dimensions and accurately pinpoint a location in the sinus with the aid of diagnostic images such as computed tomography (CT) or magnetic resonance (MR). It also enables surgeons to track instruments in relation to a patient’s anatomy and track the anatomy itself during a surgical procedure. The term "navigation" is synonymous with image-guided surgery (IGS), computer-assisted/computer-aided surgery (CAS). Ultimately, using navigation helps the surgeon accurately detect where he or she is working in the patient's body at every moment during surgery. This capability enables the surgeon to make smaller incisions. When trauma to the body is minimized, the patient may spend less time in recovery and may experience fewer complications. By enabling the surgeon to navigate through the delicate landscape of the sinus or brain more accurately, the surgeon can remove a brain tumor or sinus infection, possibly without impacting healthy tissue. Coblation is an advanced technology that combines gentle radiofrequency energy with a natural salt solution to quickly and safely remove tonsils and adenoids. Because traditional procedures use high levels of heat to remove the tonsils and adenoids, damage to surrounding healthy tissue is common. Coblation does not remove the tonsils or adenoids by heating or burning, leaving the healthy tissue surrounding the tonsils unaffected. Traditional methods remove tonsils and adenoids by cutting or burning, which can cause extensive pain and damage to surrounding healthy tissue. The innovative approach of Coblation results in minimal pain and rapid recovery for patients. During surgery, blood, tissue or other debris from the surgical site can splatter onto the viewing end of the endoscope, thereby impairing the field of view through the endoscope. The surgical debris obscuring the field view of the endoscope must be removed and so it is necessary to interrupt the procedure and remove the endoscope for cleaning, thereby unnecessarily prolonging the procedure. Because of the inconvenience of removing and cleaning an endoscope during surgery, some surgeons prefer to use an endoscope with a sheath having a provision for flushing away surgical debris obscuring the endoscope view. 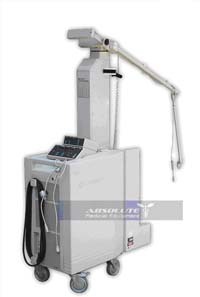 The Coherent UltraPulse 5000c laser systems are often used to treat photo damage, for skin resurfacing, hair restoration and other endoscopic or incisional methods of medical procedures. The 5000c has a pattern generated which is computerized and contributes speed and flexibility to the cosmetic lasers. Another benefit to this laser system is that it increases your body's collagen so that skin cells can grow and rejuvenate when old or damaged tissue is taken away. Applications in ENT, including removing tumors and polyps in the nasal cavities, the mouth and vocal cords. Surgical removal of malignant tumors of the vocal cords can now be performed via the mouth by using the laser attached to a microscope. making the XPS 3000 System the most versatile, most powerful ENT system yet.